Through years of yoga classes, I’ve gamely moved into Ardha Chandrasana (Half Moon Pose) hundreds of times—balancing precariously with one hand on the floor, the other reaching skyward, and one leg shooting back from my hips. I thought I had it mastered. Then I enrolled in a Pilates class to assist my recovery from an injury, and when I came back to Half Moon, I discovered a whole new dimension to it. I’m not alone in bringing Pilates to my yoga mat, of course. Many yogis are recognizing that Pilates—an 85-year-old system of body conditioning designed by German émigré Joseph Pilates, is a rewarding complement to asana practice. And some, like me, are finding that Pilates’s focus on building and engaging a strong core can propel their yoga practice into new realms. Interestingly, much of Joseph Pilates’s technique was derived from his study of Eastern philosophy, and many say this included yoga. In his book Pilates’ Return to Life Through Contrology, he wrote that age is gauged not by years but by the suppleness of the spine. He also noted that full, deep breathing is a key component to efficient movement. And a stint on any Pilates mat reveals similarities between Pilates exercises and asanas: Side Lift is much like Vasisthasana (Pose Dedicated to the Sage Vasistha), Roll Over is reminiscent of Halasana (Plow Pose), and Swimming could be mistaken for Salabhasana (Locust Pose). But the similarities stop there. While yogis are instructed to either hold poses or flow quickly through them in vinyasas, Pilates is a rhythmic practice of precise movements repeated five to 10 times for each exercise. “There is a method to the practice, with a simultaneous emphasis on flow of movement, but a controlled flow,” explains Rebecca Slovin, a certified Pilates and yoga instructor in San Francisco. By focusing on targeted movements that develop core strength, Pilates can help yogis build a stable center, lengthen the side body, and increase awareness of alignment. “Pilates helps some of my [yoga] students slow down and work deeper,” Slovin says. Ultimately, she says, it can help yogis get stronger, avoid injury, and sometimes advance into poses that they hadn’t previously felt were possible. The core, also called the Powerhouse, is the body’s center of gravity; it is composed of the muscles of the lower abdomen, lower back, buttocks, and pelvic floor. Jillian Hessel, a Pilates instructor and yogi in Los Angeles who instructs the sequence of Pilates exercises shown here, explains how to locate your Powerhouse: Stand with one hand on your lower abdomen and the other on your lower back. Inhale deeply through your nose and then exhale through your mouth while pulling the lower abdominals up and into the spine, simultaneously drawing your pelvic floor muscles up and squeezing the base of your buttocks together. The aim is to engage and strengthen the transversus abdominis (the deepest layer of abs that wrap around the torso horizontally), the obliques, the lower back muscles, and the pelvic floor during complex movements. By doing so, you develop a strong, corsetlike support system that protects your back from injury. “Many dancers and yogis who come to Pilates are hyperflexible,” Liekens says. And sometimes these extremely bendy people rely so heavily on their flexibility that they just let their muscles stretch rather than engaging and strengthening them. “If the center is not realized or strengthened, then the structure is weak and the energy is not being channeled properly,” Liekens says. Exercises such as Seal and Swimming are ideal for challenging the core muscles and building strength, even in those who enjoy a great deal of flexibility. “As the poses get more advanced, rather than just breathing into them, you start to use your belly brain—that strong, deep core that gives you endurance and a center from which to grow,” Slovin says. For me, finding length in my side body while engaging my core transformed the way I do Chaturanga Dandasana (Four-Limbed Staff Pose). For years, I hadn’t engaged my abdominal muscles properly, so I strained my trapezius muscles. My neck hurt and my shoulders were uncomfortably sore following any challenging vinyasa class. By learning to engage my newfound stomach muscles, I discovered how to distribute the effort evenly throughout my body and ease the strain on my trapezius muscles. Now I can flow through a vinyasa without having to stop and rest my arms. Side-body awareness can come to your aid in Urdhva Mukha Svanasana (Upward-Facing Dog Pose) and Bhujangasana (Cobra Pose) as well. Instead of pushing out your chest to get into the backbend, you might find yourself focusing on grounding the pelvis, pulling in the floating ribs, and lengthening the sides to create a stable, beautiful pose. In postures like Supta Padangusthasana (Reclining Hand-to-Big-Toe Pose), your side-body consciousness can guide your alignment so that you don’t compress your torso as you pull your leg toward your body. By maintaining length in your torso and using your core strength, you find stability, even when you cross the leg over your body for the twist. For example, having asked you to lie faceup on a Styrofoam roller and breathe into your ribs, a Pilates instructor might then point out that one side of your back is stronger than the other. Once you know this, you can bring awareness to the different sides of your back and work on correcting the imbalance every time you think of it. In this same position, you can use your awareness of proper alignment to balance your inhalations and exhalations evenly on both sides. Taking this knowledge back to your yoga mat, you may discover that a simple Balasana (Child’s Pose) provides the ideal opportunity to practice engaging your back muscles evenly and distributing the breath equally between the left and right sides of the back body. The understanding of my body’s alignment that I gained through Pilates allowed me to take my Parivrtta Trikonasana (Revolved Triangle Pose) to the next level. Often, when I did this twisting Triangle in yoga class, I received the same adjustment: My teacher would come up behind me and square my hips. With increased awareness of my body’s alignment, however, I became more mindful and figured out how to adjust my hips on my own. I am now able to move my pelvis into position and keep it there even as I twist. With the help of my Pilates-enhanced obliques, I have become more stable in the pose and am able to lengthen my side body while articulating the twist deeply. In Pilates breathing, unlike in yogic pranayama, students exhale through the mouth and aim to attain a “scooped,” or flattened, abdominal wall on the exhalation. Some yogis even use what they learn from Pilates’s focus on the lower abdomen to inform the breathwork in their yoga practice. “Pilates breathing is really a form of pranayama that focuses on the lower bandhas,” Jillian Hessel says. Although she learned about the bandhas in asana, neither her Iyengar Yoga practice nor professional dance training strengthened her core—or her understanding of the abstract concepts of Mula Bandha (Root Lock) and Uddiyana Bandha (Upward Abdominal Lock)—the way Pilates breathwork has. 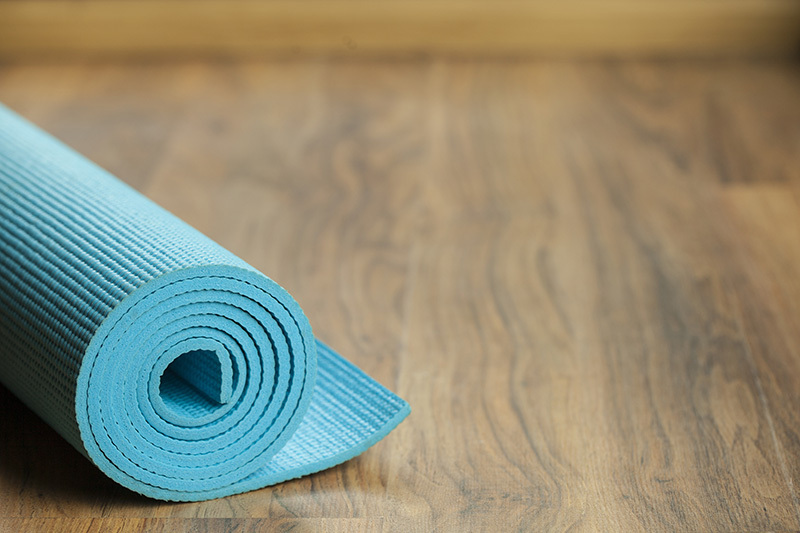 Yoga and pilates are, of course, distinct practices, but there might be times—perhaps when you’ve hit a plateau in your asana practice or are in an experimental mood—when you want to play with some Pilates techniques on your yoga mat. Mary Bischof Stoede, a certified yoga and Pilates teacher at the Pilates Center in Boulder, Colorado, suggests trying one of Pilates’s breathing techniques—in through the nose and out through the mouth while pulling the abdomen in and up—during yoga practice. “This will assist you in Mula Bandha, because when you exhale through the mouth, you have no choice but to engage that area below the navel,” she says. Stoede suggests doing Pilates exercises before you begin your asana practice. “The movement flow in Pilates is largely about strengthening the inner core, so start with that very physical practice,” she says. “Then you can slowly move into the quietness of your yoga practice.” Some students start their yoga practice with the classic Pilates move called the Hundreds, which warms the muscles, and prepares the spine for flexion, extension, and twists. Rebecca Slovin recommends incorporating Pilates principles throughout asana practice. When in Halasana, you can use the deeper awareness of your midsection that you’ve learned in Pilates to help you pull the navel to the spine. In Virabhadrasana I (Warrior Pose I), you can activate your core to engage the pelvic floor, which will enable you to move your sitting bones closer to the floor while reaching out with your arms. Slovin also suggests blending some Pilates into your seated poses; try Roll Over or scooping your abdomen inward as you move into Paschimottanasana (Seated Forward Bend). However you choose to bring Pilates into your yoga practice, Hessel points out that while the slow and controlled movements make the risk of injury extremely low for a healthy person, those with a history of back or neck pain—particularly a disk problem—should check with a doctor before starting a Pilates mat program. Hessel says they should also seek out a professional teacher rather than trying to learn Pilates on their own, since it’s easier to modify exercises for an injured individual within the context of a private lesson. Joseph Pilates wrote that one’s self-confidence and health come from a balanced trinity of body, mind, and spirit—a belief that probably sounds pretty familiar to most yogis. The sheer physical emphasis of Pilates can give yogis a new body awareness about their strengths and weaknesses, help them become more mindful of their limitations, and give them insight into how the body moves. After experiencing the emphasis on precise, controlled movement and core strength, you may find that a simple Tadasana (Mountain Pose) becomes an opportunity to explore your newfound corset of muscles, or that a Handstand becomes a vehicle in which to engage the obliques and obtain balance.